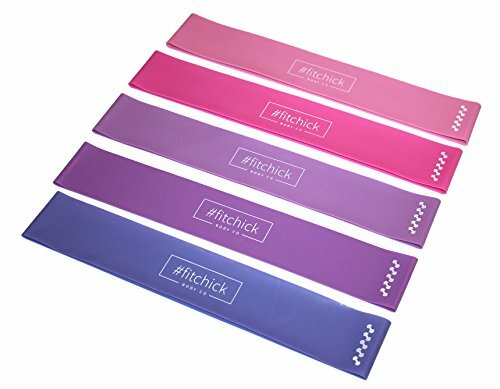 When you’re someone that travels often, doesn’t have the time or desire to hit the gym, or enjoys to mix up your workout, you may find resistance bands are perfect for you as they are great to use at home, in a park, hotel room, at the beach and even at the gym! The many benefits to these simple exercise tools are endless; versatile, convenient, inexpensive, safe and effective, the more you discover about the advantages of resistance bands, the more you’ll be motivated to add them to your own training programs. Resistance bands can be bought as an individual loop or flat band, or as a set. Research free YouTube videos for great workouts that you can do outside the gym, or in addition to your gym and weight training sessions. Resistance bands come in multiple resistance levels, usually light, medium or heavy. You can further adjust the amount of resistance during exercise just by giving more or less slack on the band, as well as by combining multiple resistance bands to increase the challenge. Resistance band exercises are often based on familiar strength-training moves. For example, if you stand on one end of the band and curl your arm up while holding the other end, you’ve replaced your standard dumbbell bicep curl. Many resistance band kits come with suggested exercises for nearly every major muscle group in your body. Stepping on one end of a resistance band or looping it around a stationary object, for example, opens up many exercise possibilities. When you don’t have a lot of room for a home gym, resistance bands are a great option that store in very little space. Because they are so small and portable, resistance bands are a great way to take your workout with you when you travel. There are many resistance band exercises that can easily be done in the small space of a hotel room. Over time, your muscles adapt to any new exercise routine. It’s a good idea to mix it up by cross-training with free weights, machines and resistance band exercises. Each will work your muscles in a slightly different way. 8. No Training Buddy? No Problem! Resistance bands offer strength-training without the risk of dropping a heavy weight on your foot or crushing your fingers between weight plates. That makes them ideal for working out when you don’t have a personal trainer or exercise partner to spot you. While resistance bands work great on their own, they can also be combined with other exercise equipment. Performing bicep curls with both a resistance band and a dumbbell will give you the combined benefits of each type of equipment. 13 Ways To Get A Better Sleep! Sleep can be a struggle to catch every night, join the club. Each night we move through light, deep and dream (REM) sleep in a cycle, with a cycle lasting 90-110 minutes and each adult needing to complete, on average, 5 complete cycles. Good quality sleep in good quantities. If this doesn’t sound like your average night, then these hacks may be one way to get you catching those ZZZZs again. * East wholegrains, nuts and leafy green veg. We need certain fundamental vitamins and minerals to be able to produce those wonderful sleepy hormones, melatonin and serotonin. * Owners that share their bed with their beloved fur-babies may not be getting a great sleep – think about alternative sleeping arrangements? * Smelling lavender oil before bed can result in a deeper, more restorative sleep. * Kiwi fruit not only contain high levels of antioxidants, but also that wonderful sleepy friend of ours, serotonin. Try eating a couple before bedtime. * As your body temperature drops, it can make you sleep better so try a hot shower 2 hours before you bed. * Make friends with an aloe-vera plant; keeping one in your bedroom creates purer air by emitting oxygen and taking up carbon dioxide. Purer air = sleep. * White noise such as a pedestal fan can help shut down your busy brain. * We all know this one: put electronic devises away at least 1 hour before bedtime. * Read. Reading can calm your mind. * Get some sun! Yes, that’s right. 10-15 minutes of direct sunlight during the morning will assist in maintaining healthy melatonin production and a balance body-clock for sleep/wake cycles. * Don’t go to bed hungry or too full. Give your body a full 90 minutes before bedtime to digest your meal and your blood sugar levels to stabilise. On the other hand, going to bed hungry can lead to a restless sleep, or waking far too early. As can dehydration so make sure you hydrate adequately during the day. * Keep a note book next to your bed; if there’s something you need to deal with and it’s keeping you from falling asleep or waking you up, write it down. * The best sleep occurs between 10 pm and 2 am so getting into the routine of falling asleep by 10 pm, will help you to feel refreshed in the morning. It almost sounds too good to be true, but there are some delicious metabolism boosting foods that you can eat that will help to trigger the release of fat destroying hormones, spike your metabolism and eliminate toxins from your body. Some of these foods you may have in your cupboard or pantry, and you may be unaware of their potential. So here is a quick list of a few of my favourites. Studies have shown that tomatoes can help in the lowering of systemic inflammation in overweight women, as well as increase the release of a fat burning protein called adiponectin. Such as meat, fish, dairy, legumes, eggs, nuts and seeds – the body requires more energy to digest these foods leaving you feeling fuller for longer. Protein also plays an important role in retaining muscle mass. Chilli is full of capsaicin – the ingredient that gives chilli peppers their heat – which studies have found may increase the number of calories burned per day as well as assist in reducing appetite and increase satiety (feeling full). Coffee has been found to increase metabolism by up to 11% , it also acts as a natural performance enhancer enabling you to train at the gym more intensely. Tea, and in particular oolong and green tea, have both been found to increase metabolism by 4-10%. These teas may also play a role in helping the body to burned stored fat for energy more effectively. Try adding ginger to hot water to make a tea- studies have reported that the tea can help to decrease levels of hunger and increase metabolism by burning up to 43 more calories than drinking plain hot water. Drinking water can increase the metabolic rate by up to a massive 30%! Not to mention, it has been shown that thirst can be confused with hunger – so try drinking a glass or two of water before cracking open the pantry for something to eat. Now this is one food that makes us happy to see in a list such as this: did you know that dark chocolate is a great source of magnesium and that magnesium stimulates the release of that wonderful fat burning protein, adiponectin. Just try to keep your dark chocolate consumption to a couple of squares a day. Just ¼ teaspoon a day can help with fat loss. Cinnamon has great thermogenic properties and also plays a key role in managing sugar cravings. Greens such as spinach and kale, contain high amounts of fibre which can increase fat burning by up to 30%. These wonderful greens also help to suppress the appetite and clean your body of toxins. Watermelon contains a high concentration of the amino acid, arginine. Arginine can assist in building and retaining muscle mass which in turn, speeds up the metabolism. Do we really need another excuse to eat watermelon? Try eating wild salmon on a regular basis. The omega-3s in wild salmon may help to improve insulin sensitivity which will aid in reducing belly fat and assist with the activation of the thyroid hormone for a metabolism boost! If you are healthy, salt in your diet really shouldn’t be something to lose sleep over. Did you know that us humans have a self-regulating system that allows our body to achieve sodium balance? When sodium levels drop below 3,000 mg, 2 amazing hormones – angiotensin and aldosterone, begin to rise, causing our bodies to hang onto the remaining sodium, and our brain to signal to us that we need salt, and therefore, we experience cravings. However, too much of that action, and it can have an effect on our vascular health. If we are healthy, our body has mechanisms to get rid of excess sodium through sweat and urine but it is still wise to try to maintain a healthy diet and not go gung-ho with the salt shaker. Health reasons aside, by being aware of the sodium in your ingredients, you will also become a more active participant in building and balancing the tastes in a dish. By being “sodium mindful,” you can season your dishes consciously; sometimes opting for a less salty product and other times, choosing it on purpose for a flavour advantage—like using a bit of Parmesan or chopped anchovies to perk things up instead of plain salt from the shaker. Soy sauce, Teriyaki sauce, fish sauce, and miso all contain a lot of sodium. So if you need or prefer to limit your sodium intake, try other natural ingredients such as tomatoes, green tea, and mushrooms. Depending on the brand, some bread may have up to 200 mg of sodium in 1 slice, which is far from terrible, but a good reminder to choose your loaf wisely. Make morning toast count by picking one brimming with other flavours from the likes of oats, whole grains, herbs, nuts, and seeds. And if you feel inspired, make your own! Not all frozen veg are treated equal. Some products, like peas, will contain no sodium while others contain upwards of 100mg per cup, depending on the brand. The difference? Pre-seasoning and blanching—a technique used to quickly cook vegetables while maintaining a vibrant colour, often using salted water. Just be aware and avoid salty overload by giving vegetables a taste first before adding your own pinch. This is usually the biggest sodium shock for those reading the carton for the first time. One cup of cow milk equals about 100mg of sodium. A small cup of yogurt means about the same. And buttermilk and condensed milk land at 250mg and 400mg per cup, depending on product. Even nut milks and soy milks contribute around 100mg of sodium per cup. This doesn’t mean you should avoid milk, just be mindful. Salt is one of the most important parts of the pickling and preserving process. And while you don’t need salt to get a pickle-ish taste—vinegar plus strong herbs and spices will get the job done. So, what should we consider when we’re shopping, eating, cooking? Try and go for whole foods, not pre-packaged. Up your intake of potassium as this mineral works in tandem with sodium to help maintain a healthy fluid balance (probably more important that solely focussing on reducing sodium). Fruit and veg are great sources, especially lima beans, butternut pumpkin and cooked spinach. Food prepping. Fad? Or a smarter way of making good use of your time? Food prepping is a great way to make healthier choices when you don’t have time to cook and takes away the stress of what to eat, every day. Good bye impulse eating! Formulate what meals you want to prep in advance, and an ingredients list. It may work for you to plan on a Friday, shop on a Saturday, and prep on a Sunday. Stick to your list when grocery shopping. And shop around – check out your local butcher, fish monger, green grocer. Be savvy and this could be a very cost effective way of managing your own or your family food budget. You can either cook and portion out complete meals, or just prep the ingredients that you’ll be using over the week. It may work to prepare a combination of both. For example, cook up a big batch of meatballs for Sunday dinner, portion out what you won’t be eating that night, and freeze batches in microwavable containers for nights when you want a simple, quick meal. Oven bake chicken tenders or breasts, slice and freeze. Prepare and chop a rainbow of fresh veg and store these in individual air-tight containers, in your fridge, so you only need to take out what you’ll be eating each time. Divide raw mince and create individual portions, sealed in snap-lock bags, and freeze. You can do this with other raw meats such as diced chicken, lean bacon etc. Freeze raw meat the same day you purchase it. Otherwise, store it on the bottom shelf of the fridge. Label and date your food. Store chopped up veg separate to raw meat. Invest in good quality, freezer and microwave safe containers. Keep Hard boiled eggs in the fridge for a grab-and-go snack or protein addition to your meal. Pasta can be pre-cooked and frozen and kept in the fridge for up to 5 days. Vegetable soup can be a filling, and fast meal. The flavour will improve over a few days. Chuck in some chopped chicken, a handful of pasta or pulses. Prep your snacks – portion our dried fruit and nuts into small, individual containers and store in your pantry. Prepare salad dressing or sauces separately – don’t add this to your salad until you are ready to eat. Buy kitchen scales if you are wanting to portion our equal quantities for storage.